At ease, sailor! We're here to relax and party, not swab the deck. No need to get dirty this Halloween (unless you want to, of course) – this costume is all about fun on the high seas! Sailors traditionally have a pretty tough job: from cleaning the decks to maintaining the on-board equipment, they work around the clock to keep their ship afloat and their captain happy. Because if they captain’s not happy, then no one is. And we wouldn’t want that, would we? Halloween is a time for celebration and revelry, and this costume will take your sailor from the hard work on the ship to a fun night on leave in no time! Prove that seamen really know how to wet their whistles with this Men’s Deckhand Sailor Costume. 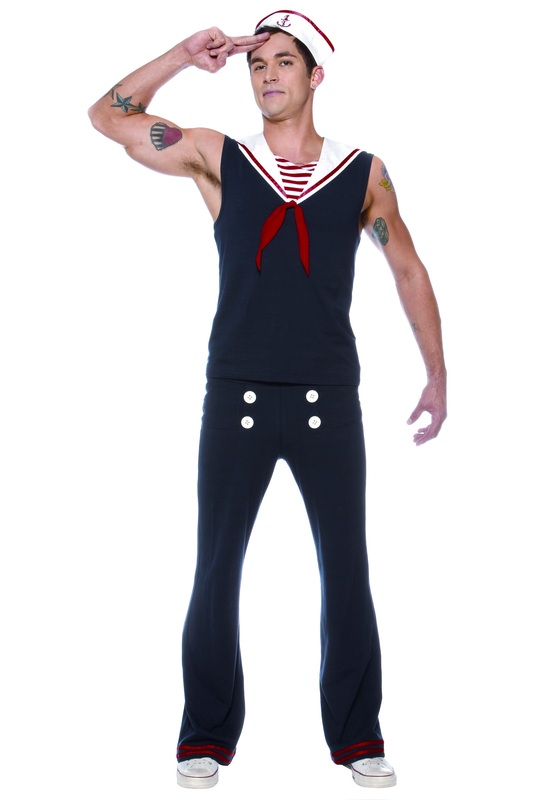 This 100% polyester sailor costume comes with everything you need to get ready for the high seas (or your next party) this Halloween. The navy blue sleeveless shirt has a red and white striped inset for added detail. The white sailor collar has red trim and a bow at center with 2 stars on the back. The matching pants have an elastic waistband for a comfortable fit and they also have decorative buttons for a look traditional of mid-century sailors. And no sailor is ready for the sea without his hat, so this costume includes a white sailor hat that features red trim and a skull and anchor on the front. Whether you are going it alone or with a crew this Halloween, you’ll be sure to make a statement in this sailor costume!